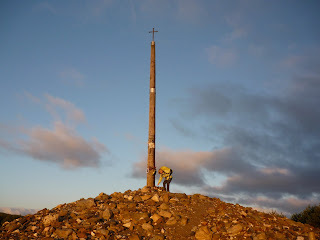 Today we had a freezing cold but glorious climb from Foncebadón to Manjarin on our 29km way to Ponferrada. 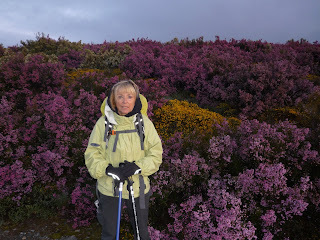 The mountain laurels and heather were in spectacular abundance carpeting the mountain in yellow, pink, purple and white bushes. 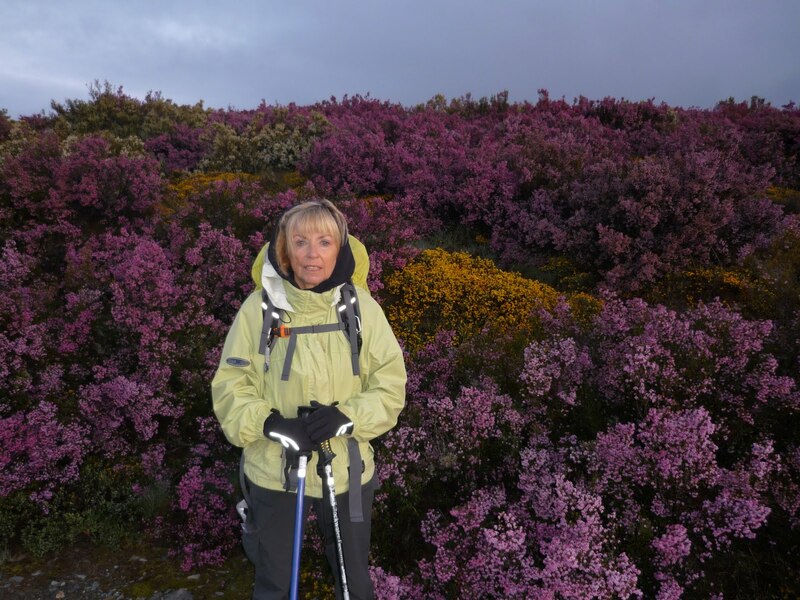 With the deep valleys below and the snow capped mountains in the distance and the paths lined with these wonderful spring flowers it was an amazing walk. However, I am hoping that those majestic snow-capped mountains remain a distant view and that we don´t have to climb them any time soon. Just a couple kilometres past Foncebadón, we reached La Cruz de Ferro where we left the stones that we have carried from Canada and then just beond that we were at the highest point of the Camino walk and it was all downhill for the rest of the day. Coming down over the rocky path was really difficult and tough on the nagging injuries. Molinaseca looked like a charming village and a great place to stay but, because it wasn´t yet noon hour, Dayton and I decided to keep going to Ponferrada. While I´m glad we have that two hour walk to Ponferrada out of the way, I´m less than charmed by the alberque in Ponferrada. It´s a zoo; like Grand Central Station, crowded, noisy, with at least a dozen people cooking in the kitchen at a time and with a steady stream of people checking in all afternoon. The four person dormitories noted in the guidebook are a myth and the showers are freezing. All together it just adds up to irritating. John is probably basking in ambience in Molinaseca. We also had another blast of reality hit us as we just learned that someone at the alberque we stayed at last night had all his money stolen this morning as people were getting ready to leave for the day. We´ve all been very blasé and naive about our belongings up to now. Who knew pilgrims stole! But tomorrow´s a new day and hopefully it will be another great walk. The reality of thievery among pilgrims has come upon you. Be very careful now that you know one among you is not there just for the walk. Take care of the injuries. And keep track of John the wanderer so he might enjoy the rest of the walk! Just wanted to let you know we are thinking of you. Jordan put out some hanging baskets in the yard that look lovely :) Hang in there; we're saving you a seat around the campfire and a glass of vino!